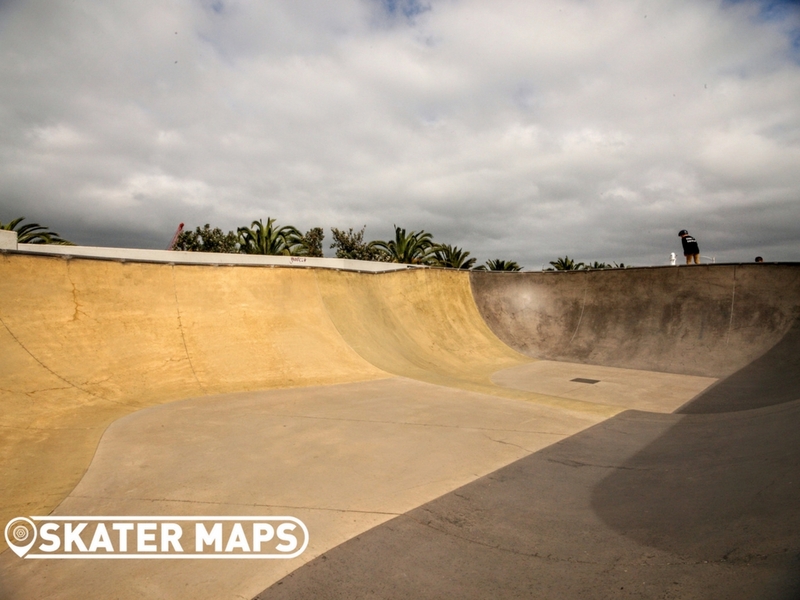 – The large bowl (which isn’t actually very big as far as large bows go) varies from around 5-7 ft with some areas of ~8 ft extensions. 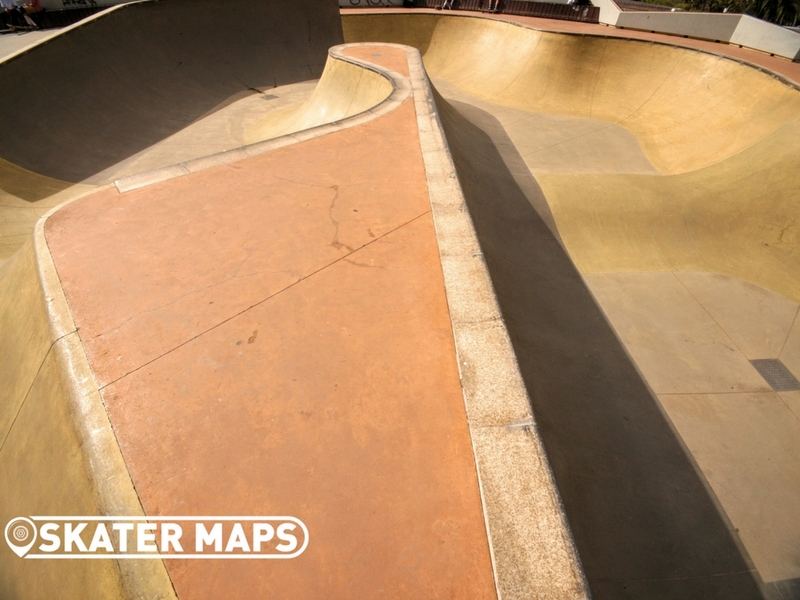 The bowl has lots of curved and sloping coping as well as a spine area with hip that can be used for transfers. 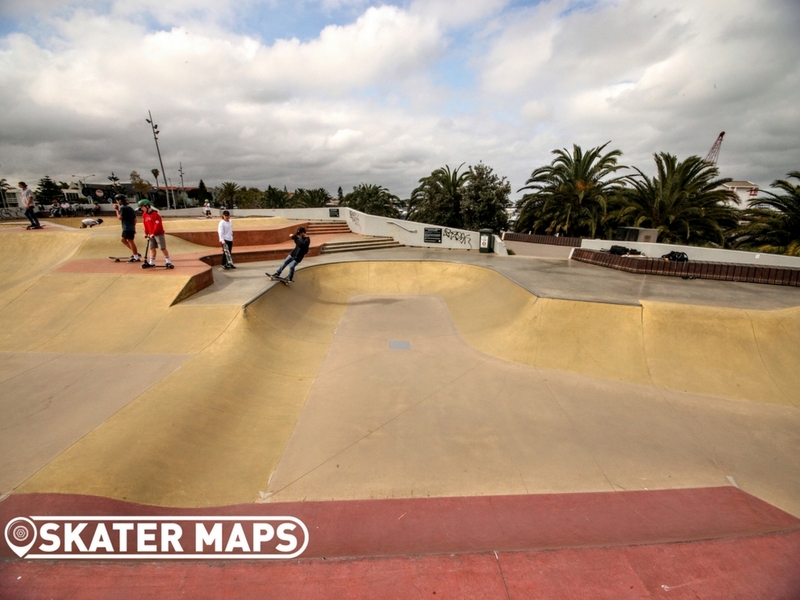 The coping is also granite, which makes for a real fast grind. 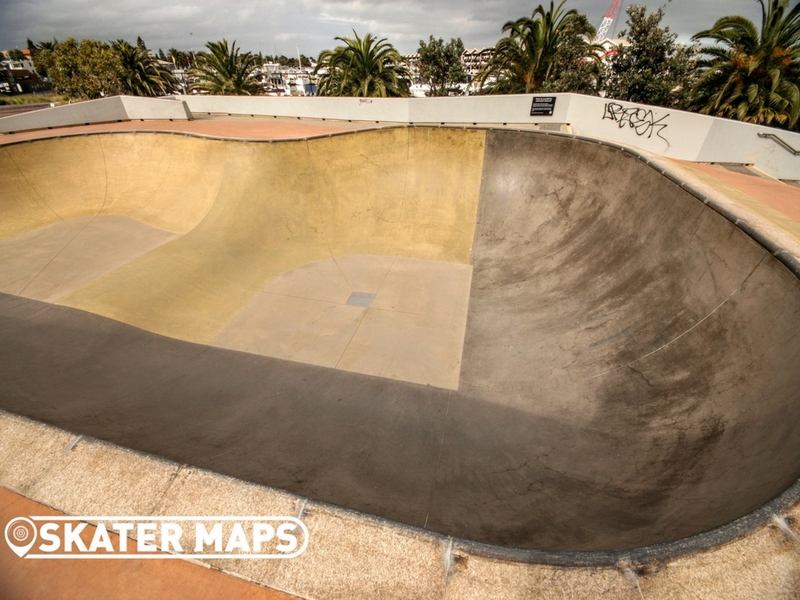 – Numerous mini bowls, smaller to medium trannies, stairs, banks, hips and rollovers. – Some concrete features to grind and some stairs to Ollie down but apart from this there’s a distinct lack of rails and boxes. 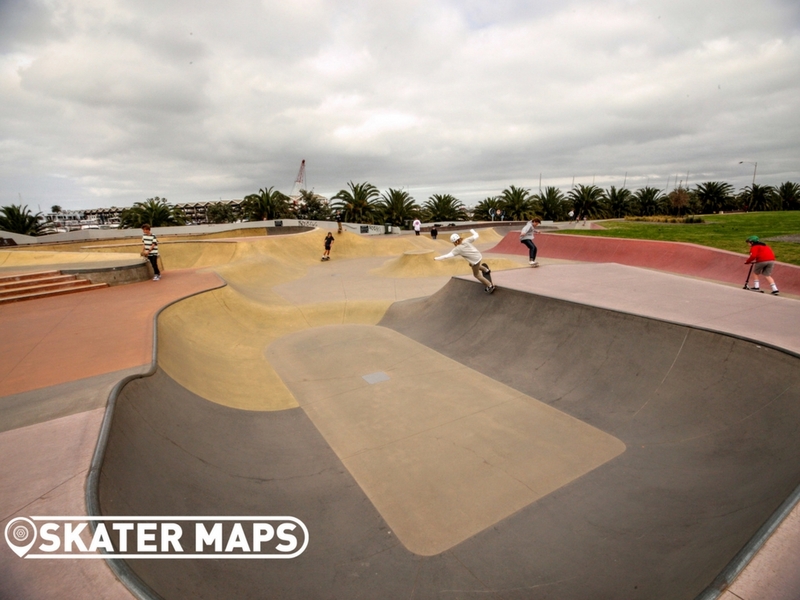 So if street skating is your thang then you might be better off heading to Riverside Skatepark in the CBD. 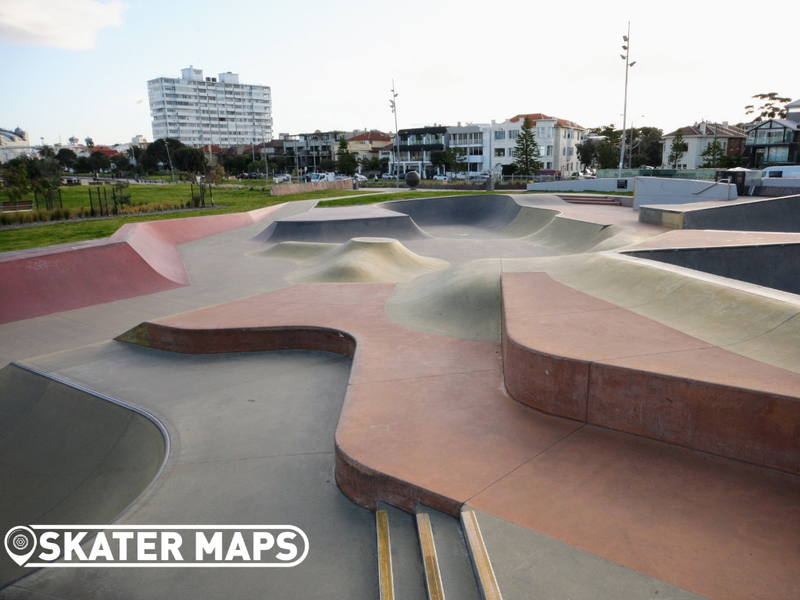 Based on its prime location the park can get very crowded on weekends and school holidays. 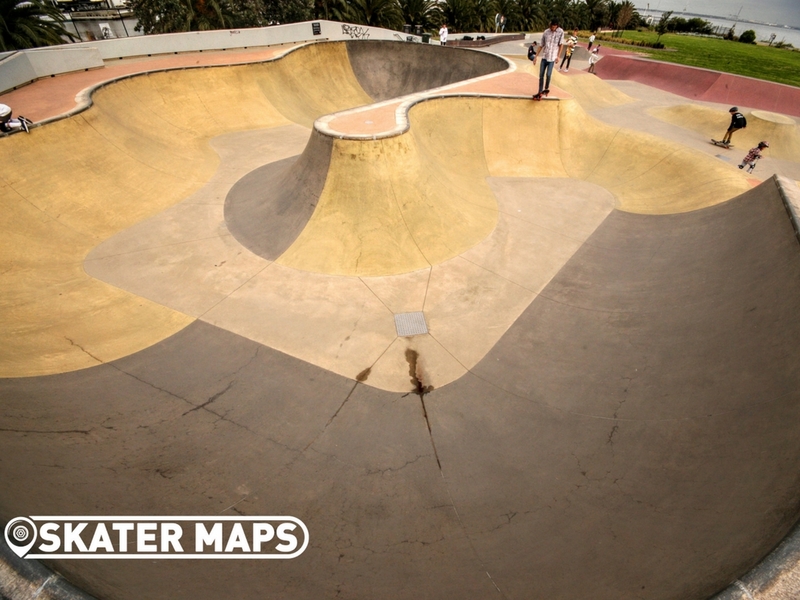 There are some mad older crew who rip down there so it’s worth checking out even just to get amongst it and to watch the show. 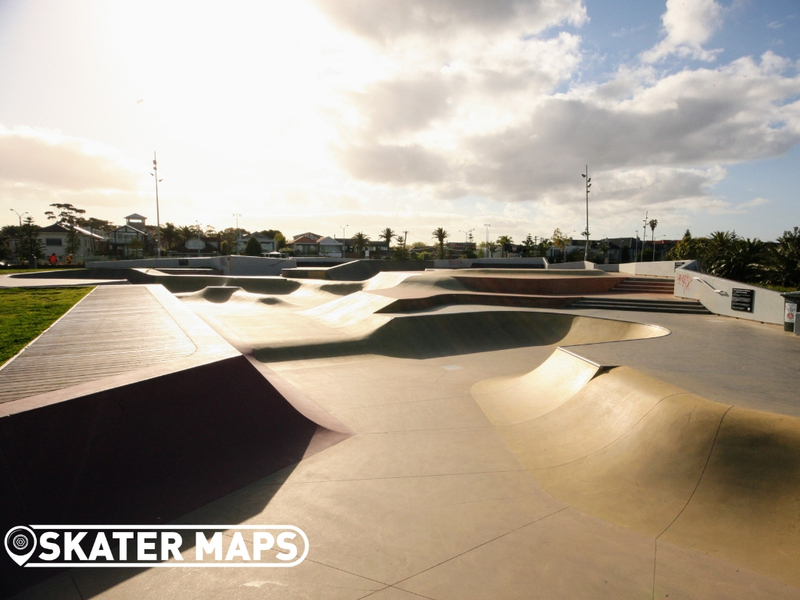 There is some lighting provided but this is probably more of a security thing than a skating after dark thing. 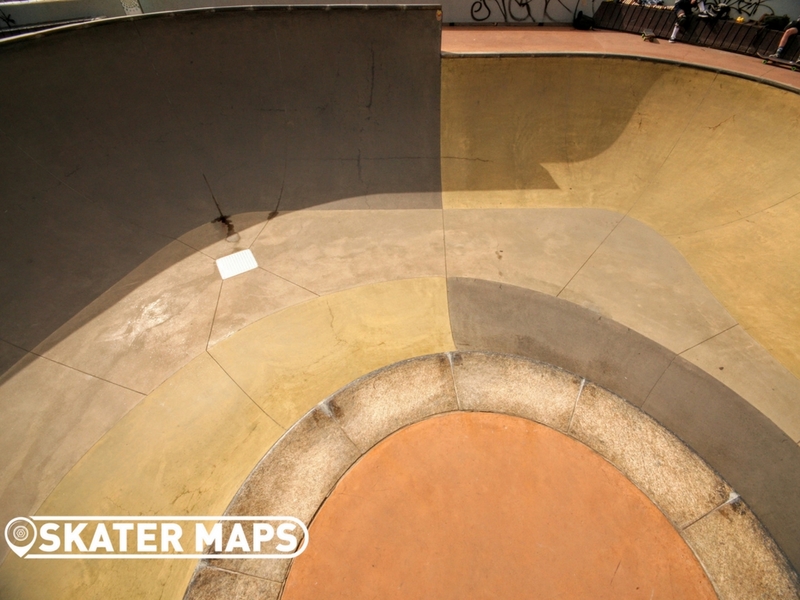 There are also plenty of vids of pros shredding the park online so check em out on YouTube. 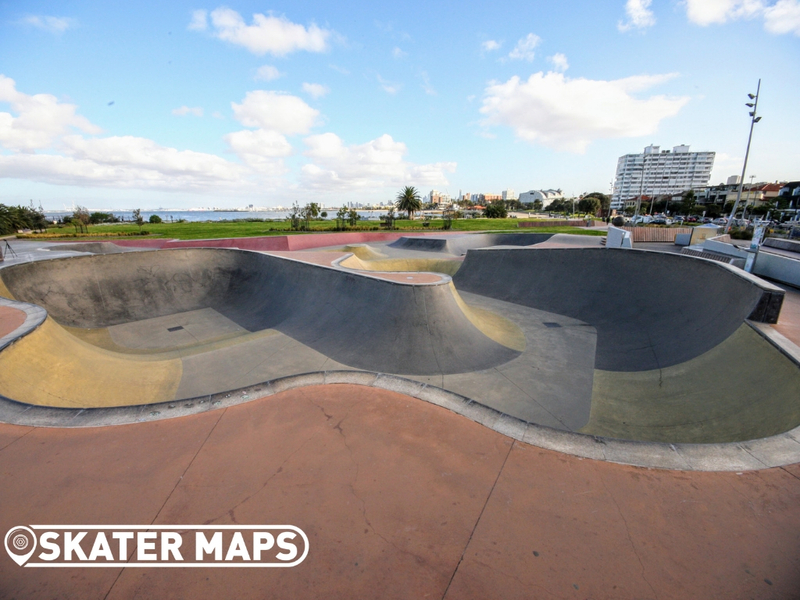 The park is located off Marine Parade St Kilda, right next to the beach and about 100m south of Luna Park. 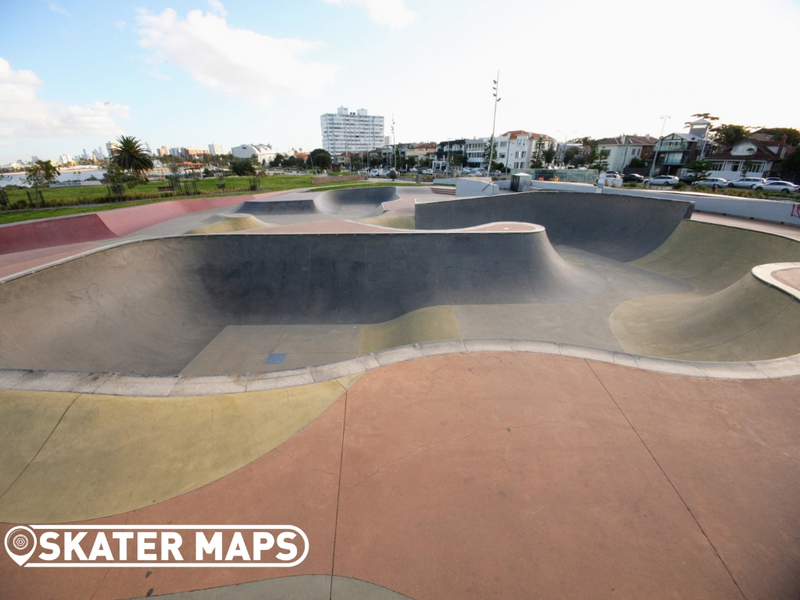 The Skatepark has its own designated parking area but it’s ticketed and gets pretty busy with beachgoers in summer anyway; so you’re probably better off trying to get a park in one of the surround streets or catching the tram. 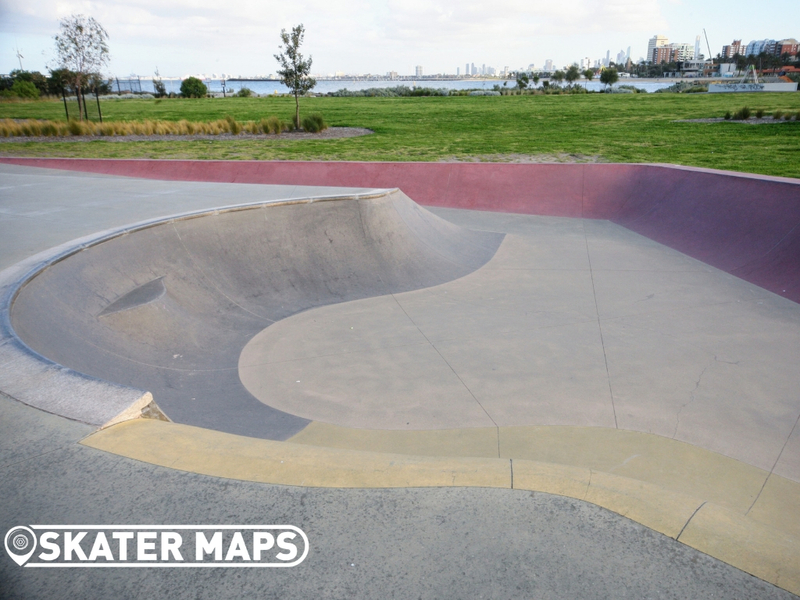 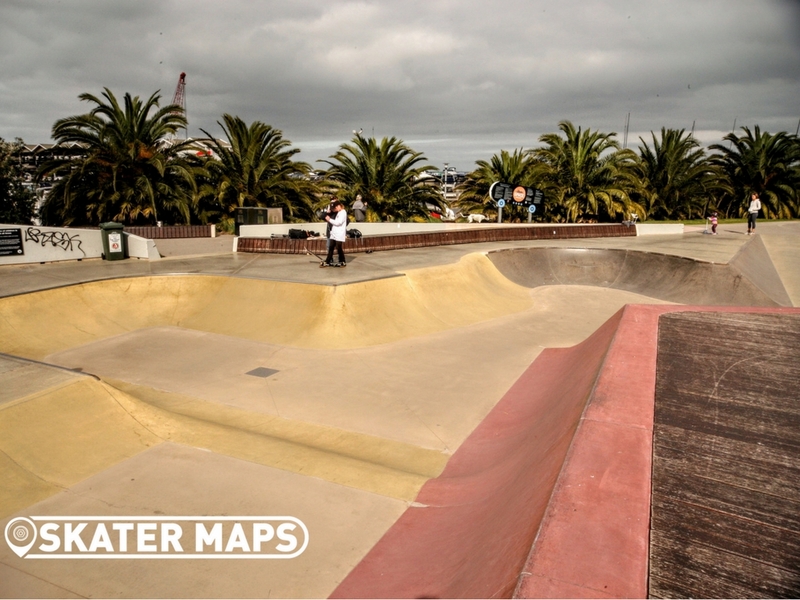 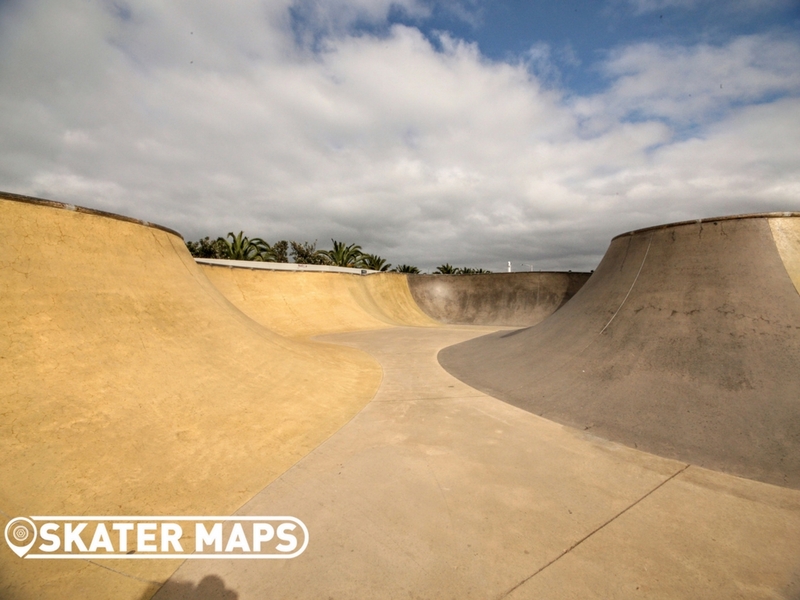 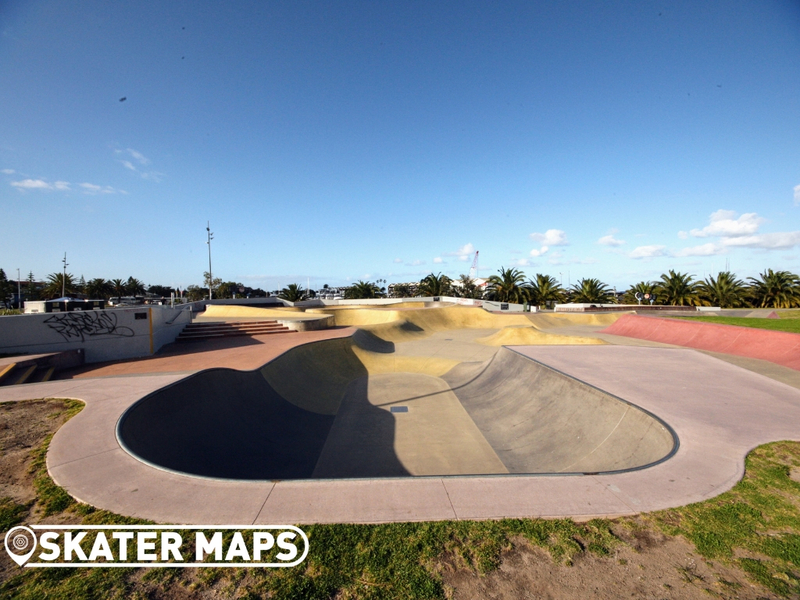 The Skatepark, according to its designer/builder convic, was designed to reflect “the undulating and ever changing nature of the coastal environment, the central skate area of St Kilda Skate Park evokes the shape of sand dunes.” Yes, no, not sure? 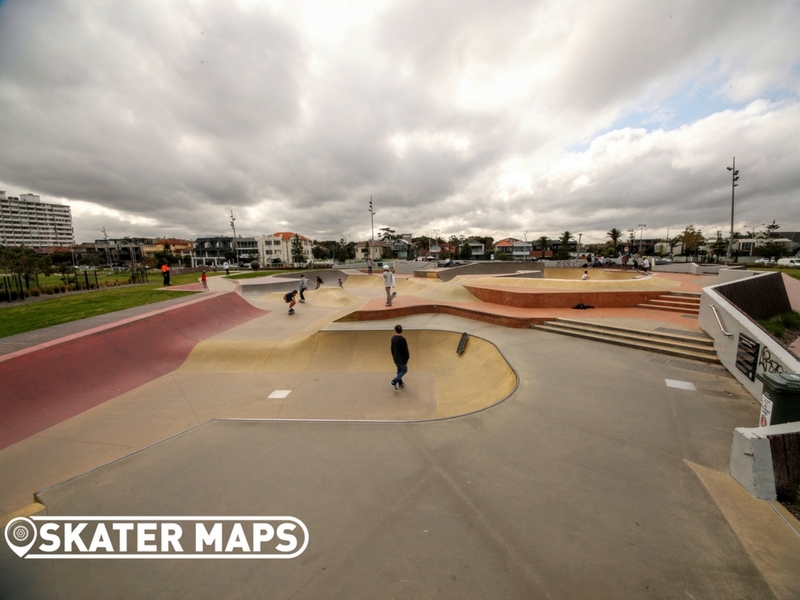 The colored concrete ramps (red, yellow, dark and light grey) are definitely more aesthetically pleasing than a plain concrete park which is perhaps why the park won the “2014 City of Port Phillip Design and Development Mayor’s Award”. 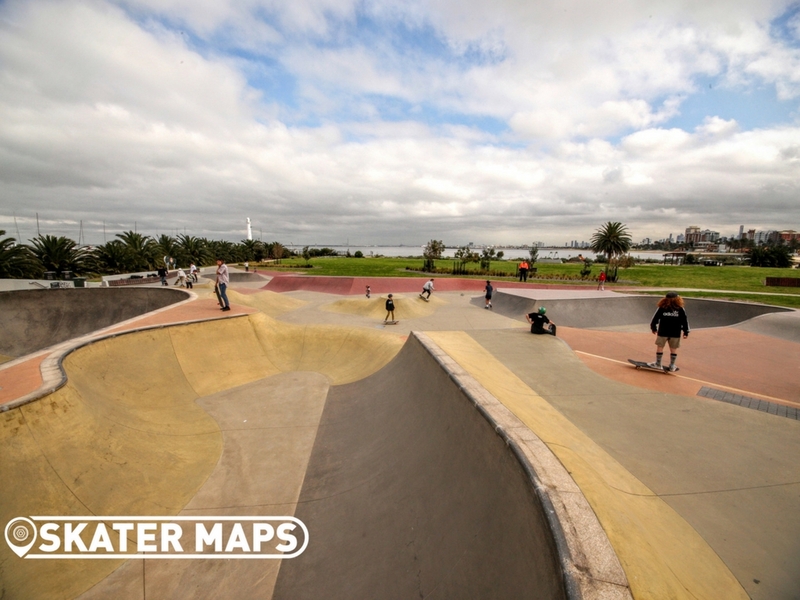 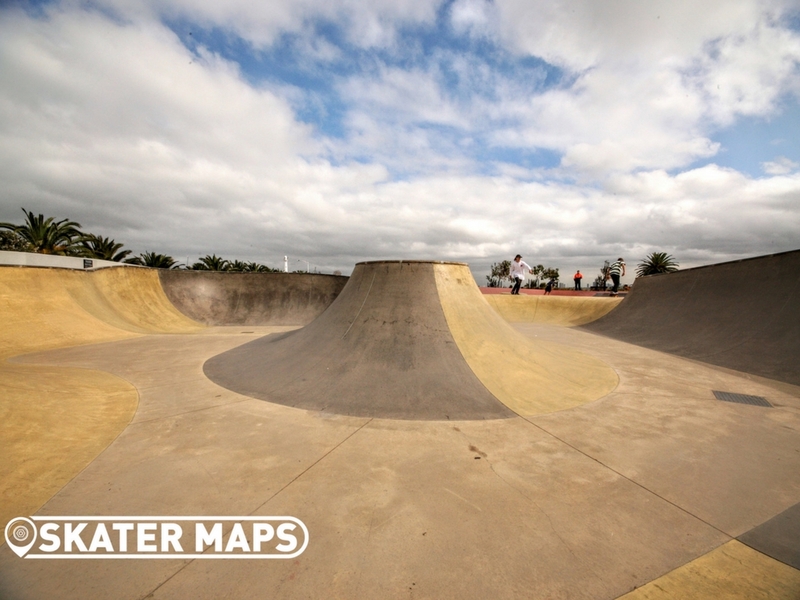 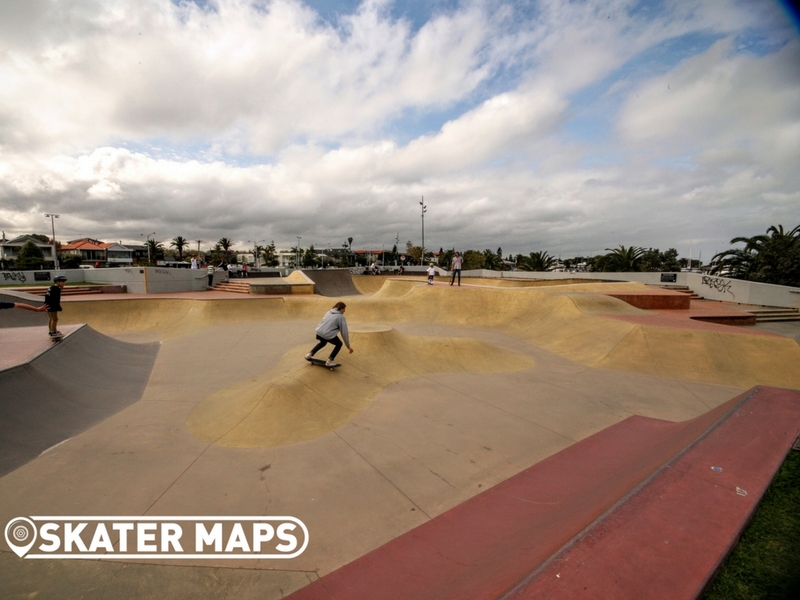 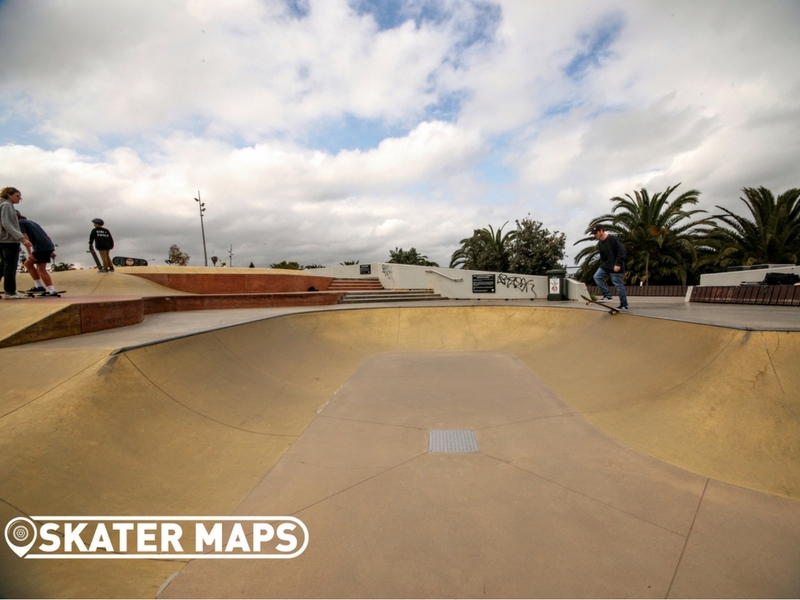 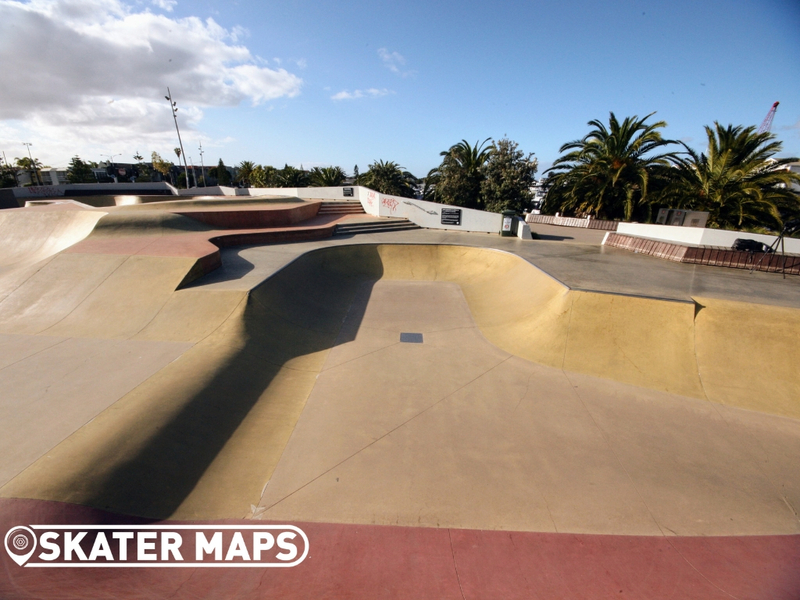 The City of Port Phillip has also installed cameras in the marina reserve so that you can check on the Skatepark live. 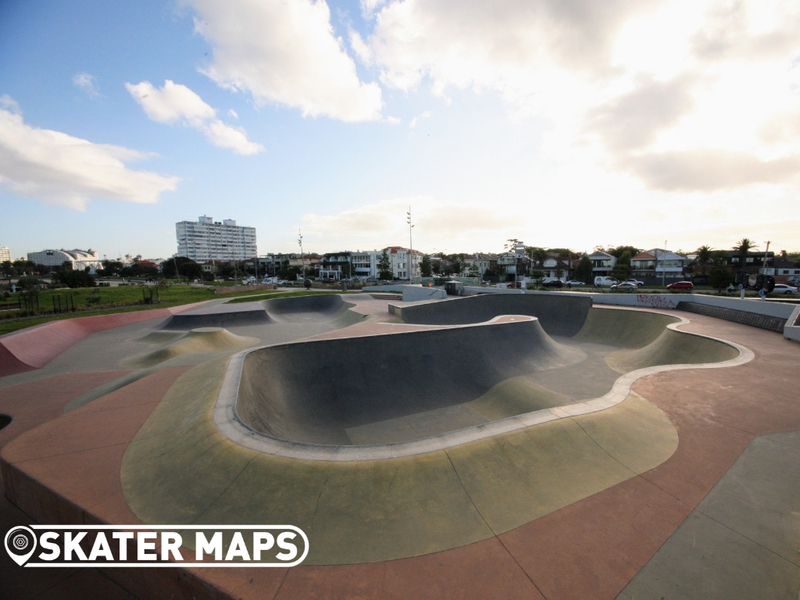 The marina reserve also includes public toilets, beachside BBQ’s, picnic and play area, seating and accessible walking paths and is a designated dogs off leash area. 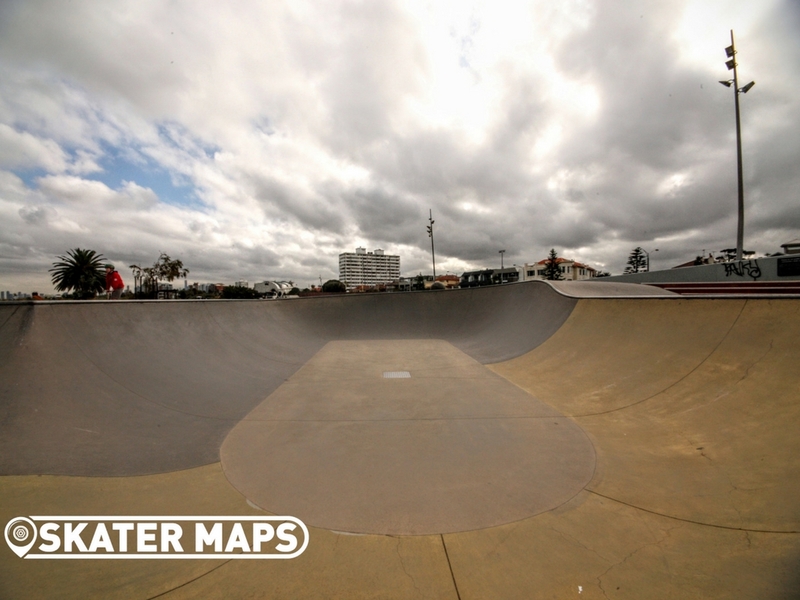 Melbourne’s answer to the Bondi Bowl…It’s not as big, it’s not as scenic, a sulphurous seaweed smell hangs in the air but it’s still pretty bloody good. 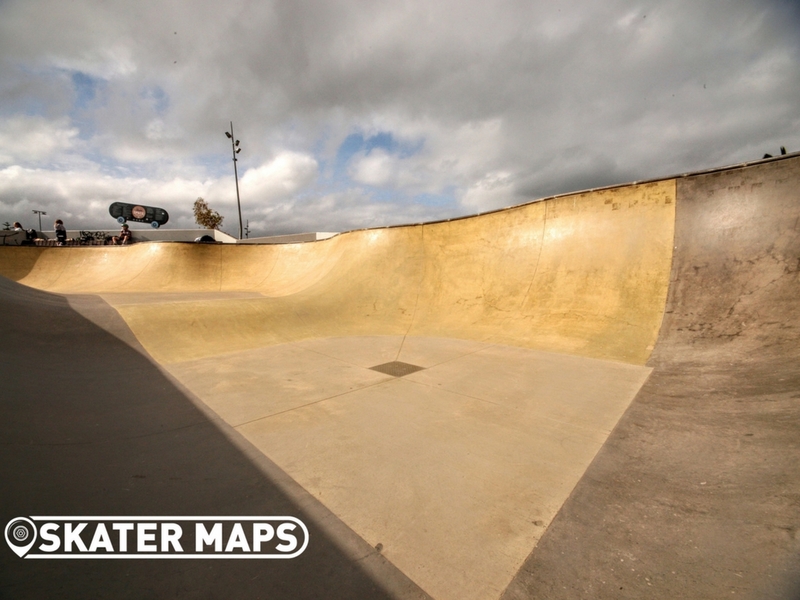 Sickest skatepark, love the 360 degree view! Boooom! 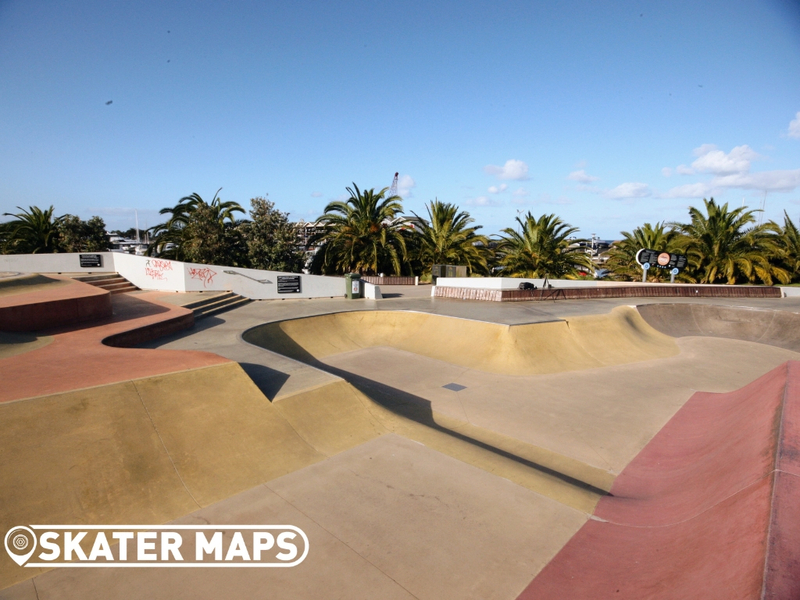 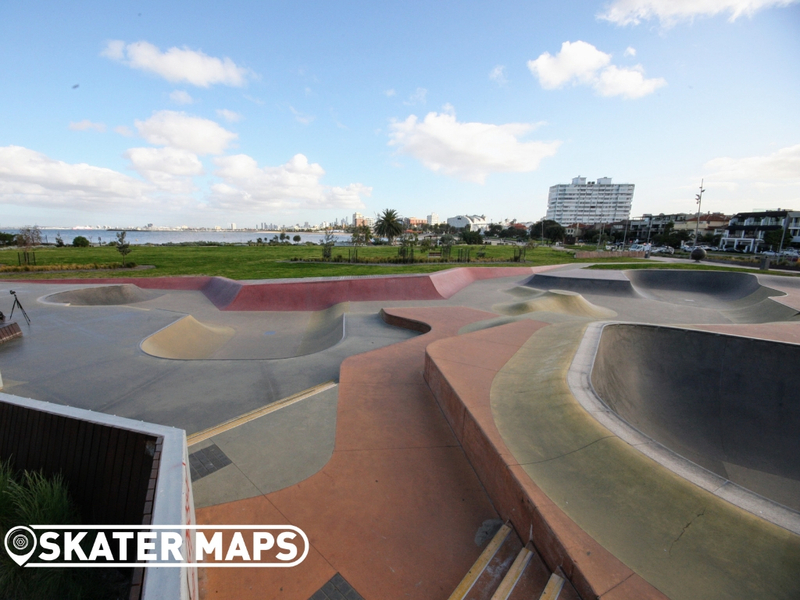 St Kilda skatepark is where it is at.